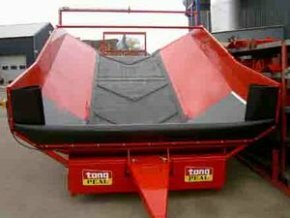 This reception hopper is desgined to have the contents of a trailer or bucket tipped into it from one end. Standard width of this rear entry infeed hopper is 2.9 meter. Belt widths are 1200 mm, 1500 mm, 1800 mm, 2100 mm and 2400 mm. Belts are supported on Renold heavy duty 4" pitch roller side chains with a breaking capacity of 1500 lb. 12.5 x 18 wheels and removable drawbar are fitted. Hopper back rubber isadjustable in height to accomodate different height trailers. Belt top drive shaft is driven from both sides to give a positive and robust drive system necessary when working in tough conditions. Variable speed via an inverter gives the ideal belt speed for the job.